If you use SOLIDWORKS and also render with Visualize, you know that manipulating the model in the view port is slightly different than SOLIDWORKS in 2016 requiring you to use the ALT key. 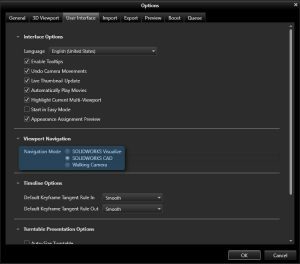 In SOLIDWORKS Visualize 2017, you can now set options to mimic the way SOLIDWORKS uses the camera. 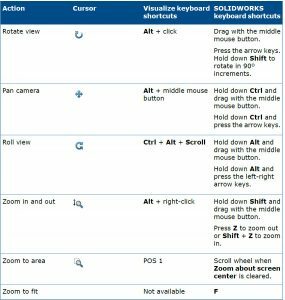 With the option set to ‘SOLIDWORKS CAD’, you can now navigate with the camera using the same buttons you use in SOLIDWORKS. For me, this is one less thing to remember when switching between multiple applications.